But around the same time a turkey gets a reprieve in the US, a terrorist in India gets the death penalty. I think it’s important to remember the Mumbai atrocities of 2008,and of which Ajmal Kasab (depicted below, and recently deceased) was the sole surviving perpetrator — if for no other reason than because he’s considered a martyr by some, and will be avenged. But first, let me wish a Happy Thanksgiving! to all Zenpundit’s American readers, and good wishes to all others. 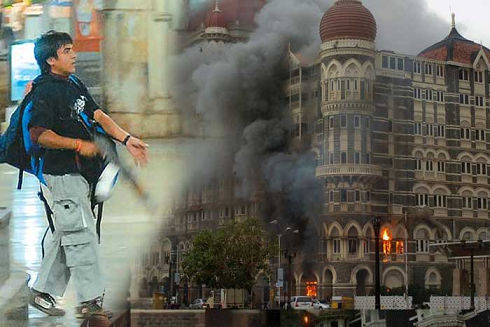 Before the execution of Ajmal Kasab, the Pakistani terrorist of the Lashkar-e-Toiba (LET), who had participated in the 26/11 terrorist strikes in Mumbai, at Pune on the morning of November 21, 2012, our security agencies must have examined the likelihood of retaliation by jihadi terrorists in Pakistan and India and strengthened security precautions to prevent retaliatory attacks. The LET and the organisations associated with it would want a quick retaliation. Pakistan’s Taliban movement threatened on Thursday to attack Indian targets to avenge the country’s execution of Mohammad Ajmal Kasab, the lone survivor of the militant squad responsible for a rampage through Mumbai that killed 166 people in 2008. Kasab was hanged on Wednesday amid great secrecy, underscoring the political sensitivity of the November 26, 2008, massacre, which still casts a pall over relations between nuclear-armed rivals Pakistan and India. “We have decided to target Indians to avenge the killing of Ajmal Kasab,” said Taliban spokesman Ehsanullah Ehsan by telephone from an undisclosed location. In the course of the coronation liturgy for Queen Elizabeth II, the words justice and mercy crop up quite often — justly and justice 8 times, and merciful and mercy 28. It appears to be a sovereign’s right and obligation to administer both, and during the ceremonial they are brought together as a symbolic pair. 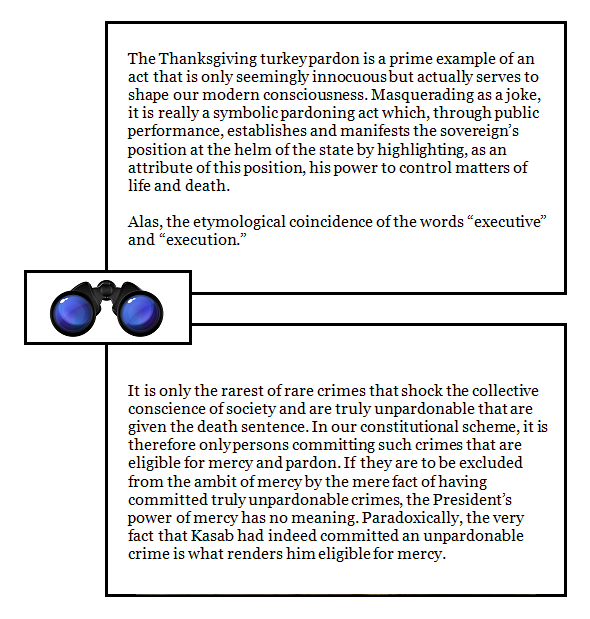 so execute justice that you forget not mercy. and lead your people in the way wherein they should go. Justice is only fair: it seems, however, that it should be tempered with mercy. Let me simply add that my own preference would be to have remitted the death penalty in Kasab’s case, and given him a life term in which to think about the lives he took. As for the turkey — happy stuffings! They called us “Indians” when they came, so we have a nickname. But we are Earth people, we are original. When they come here, I welcome them with open arms, give them a turkey dinner, corn, and all the vegetables, all the greens.